There’s A Boy In the Girls’ Bathroom is a charming and thought-provoking book. Bradley Chalkers, the protagonist, is avoided and disliked by teachers and classmates. He hates others first before they can hate him. He doesn’t really even know how to handle it when the school counselor and the new kid are nice to him. Yet he’s still a very likeable character; I sympathized with him so deeply, wanted him to succeed and thrive so much. In one of the best chapters in the book Bradley and Carla, the counselor, are talking about monsters, and how she doesn’t believe they exist. It’s a touching and lovely scene that had a profound effect on me. A wonderful thing about the book is that although there are obvious themes about expectations and self-esteem and education and friendship they are perfectly natural, a seamless part of the story, not contrived or preachy. It’s also a very amusing and funny book, and a nice quick read. Although it would be particularly salient to a middle grade student, I highly recommend this book for all ages. I haven't read this in years, but I remember loving it when I was in elementary school. 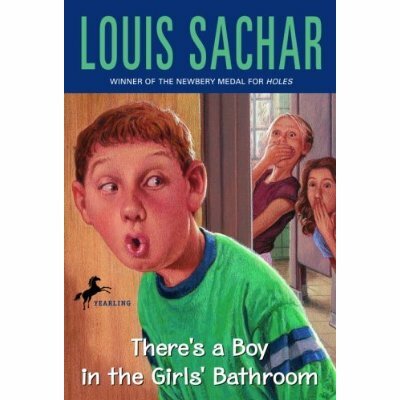 Louis Sachar is so funny. I was given this book recently by a friend who was a teacher and was thinning out her bookshelves. So my first reading was as an adult, and it came at a really perfect time in my life. I really want my 7-year-old daughter to read this, I think it might make elementary school a bit easier for her.